Illumination control is often underappreciated in designing machine vision systems but is the single most important contributor to accurate, consistent, and reliable results. 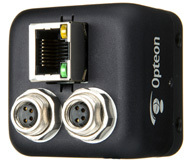 In an Opteon system you may distribute perfectly coordinated lighting control anywhere that will be most effective: in the cameras, in distributed light controllers capable of 12 kW of illumination powered over PoE, or even with the addition of Opteon single or dual channel controllers, within your lights themselves. Adding an Opteon board to your your custom or third-party lights makes them intelligent networked illumination systems that communicate and are powered over GigE PoE. No other cables are necessary, no matter how many lights and cameras may need to be synchronized for your inspection scenarios. All Opteon light controllers allow your application to precisely set the exact current through each light over the range of 50 mA to 50 A. To provide compatibility with any manufacturer's lights and to minimize power the power required, your application may control the compliance voltage from which the current supply will operate. The controller continually assesses the energy budget of each light every µS preventing any possibility of an overload even at very aggressive light levels. As with all other actions throughout an Opteon system, lighting coordination is accurate to the microsecond permitting even precise, line by line exposures in linescan camera applications.